Can an enclosed Pelton Turbine be used as a pump, perhaps through the centrifugal forces created in a enclosed Pelton Turbine when it rotates at speed? The water striking out of the buckets of a Pelton turbine is left with diminished energy but because the wheel is rotating continuously at high speeds due to very high velocity water jet then, is there any possibility of development of centrifugal forces that may lift up the water through a discharge pipe connected to the casing of the turbine which actually happens in centrifugal pumps? Is there any possibility of this, even if this happens to a small degree? Can create centrifugal forces lift the water, so it functions as pump and turbine simultaneously? Please suggest any means by which we could pump the discharged water via a pelton turbine. See one way of using pumps as turbines is an old hat in some applications. In fact, some go the other way and use a centrifugal pump as a turbine, there's some guidance (that may be dated) available on that subject. Using a pelton turbine as a pump, on the other, I'm highly sceptical about that: The shape of the turbine is so that flow from one side would not reach the other sides. So I'd expect a load of water that's moved around at low rpm, cavitation at high rpm, and a bad performance overall. Not however that this is more an answer coming from intuition than from actual knowledge. If you look at the impeller of a centrifugal pump, you see this spiral form - the fluid is gradually acceleated as it travels outward. With the pelton turbine, you have a smooth inner section and then the blades. I'd expect turbulence, and thus energy loss, at the interface. 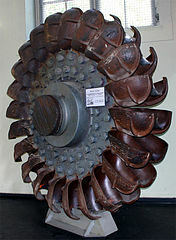 Many turbines can be switched round to be pumps of some kind. But to try to do both at the same time, is going to hit efficiency badly. There is no free energy - it's all got to come from somewhere, and it's all got to end up somewhere else: the same quantity, just in different forms. So if you're turning some of the incoming water's kinetic energy into increased gravitational potential, there will be much less work generated by the turbine that is available for other purposes. And equipment tends to be most efficient, when it's used for the purpose that it's designed for. So, one option might be to use some of the energy captured by the turbine to drive a separate pump: one that is designed for the operation you intend of it. Not the answer you're looking for? Browse other questions tagged energy water electricity or ask your own question.